On Wednesday, Defense Secretary Ashton Carter announced that the Pentagon would investigate claims by human rights organizations — including the Syrian Observatory for Human Rights, Amnesty International, and the National Coalition of Syrian Revolutionary and Opposition Forces — that American airstrikes have killed over 100 civilians since June. “The bombing of al-Tukhar may have resulted in the largest loss of civilian life by coalition operations in Syria. There must be a prompt, independent and transparent investigation to determine what happened, who was responsible, and how to avoid further needless loss of civilian life. Anyone responsible for violations of international humanitarian law must be brought to justice and victims and their families should receive full reparation,” said Magdalena Mughrabi of Amnesty International, as reported by CNN. The airstrikes Mughrabi referred to were conducted around the ISIS-controlled city of Manbij, which is the last major Islamic State holding along Syria’s northern border with Turkey. “Considered a strategic supply point between Raqqa and Turkey, it has become the site of intense fighting since a U.S.-backed alliance of Kurdish and Arab militias entered the city in June,” CNN reports, noting that these operations are intended to cut Syrian ISIS off from supplies and reinforcements flowing through Turkey — a crucial step toward weakening the Islamic State’s grip on its capital city of Raqqa. The Intercept, whose coverage is often anti-U.S. involvement abroad, describes the civilian death toll as “potentially the highest ever to result from a coalition bombing in the international campaign against ISIS,” including the destruction of a convoy that was mistaken for ISIS fighters, when it was actually civilians trying to escape from Manbij. 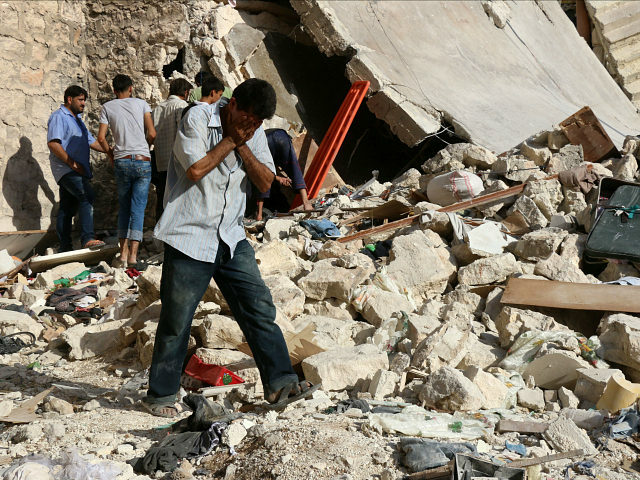 There are reportedly 70,000 civilians trapped in the city. Chris Woods of the monitoring group Airwars viewed these reports as particularly troubling because the United States and its coalition partners have generally taken great pains to avoid civilian casualties, unlike the Russians and Syrian government forces. “This is the first big assault with a U.S.-backed proxy. This bodes very badly for Mosul,” said Woods, referring to the ISIS capital in Iraq, which is expected to be the scene of a major push against the Islamic State soon and also features a heavy population of captive civilians. “Being scrupulously careful in avoiding civilian casualties and being transparent about this issue is a reflection of the civilized nature of this coalition,” Carter added. Among those plans will be the liberation of Mosul and driving Syrian ISIS forces back into their stronghold of Raqqa. “As they have in the past, senior American officials will press visiting ministers to commit additional troops and assets to the campaign, with a special focus on resources earmarked for efforts to stabilize and rebuild areas reclaimed from the Islamic State,” the Post reports. The coalition has already been hindered by conflicting agendas and domestic political trouble for various members and will now be further complicated by the coup in Turkey and Britain’s exit from the European Union. The international commitment produced by this alliance has been sparse so far, with the United States providing the vast majority of troops, especially in Syria, although France significantly increased its contributions after the ISIS attack on Paris. Many of the other nominal members of the alliance are Gulf states wrapped up in a proxy war against Iran-supported forces in Yemen.